Valentine’s Day is upon us, but you still don’t have treats ready to pass out? Fear not, I have found 50 printable Valentine’s Day cards for you to whip out at the last minute and enjoy the day in style. You’re a Great Catch! – Mission to Save has a cute goldfish-themed Valentine that says, “You’re a Great Catch!” to affix to the top of little bags of Goldfish crackers. Treat Bag Toppers – Do you have some candy on hand to pass out? Let these toppers by Generations of Savings inspire what goes in the bag and make them extra special. They’re so fun, she also has this second set available. You Make My Heart Pop – Grab some bags of popcorn and attach these printables from Creative Simplicity. My Heart Pops For You – Mom’s Confession has another idea that will make your valentines pop when you add these printables to lollipops. Capri Sun Toppers – Grab a box of Capri Sun and use the punny printables from Amber Nicole with them. She also gives some tips for a Valentine’s Day party on the cheap. Hostess Toppers – Hostess treats bring back fun childhood memories. Mission to Save has some cute toppers to go with these treats, I think my favorite is the Minion one to go on top of Twinkies. Dark Side Star Wars Printables – Calling all Star Wars fans! Do your tendencies lean more toward the dark side? Desert Chica has you covered with these adorable printables Valentine’s Day cards. BB-8 Valentines – Or if you prefer characters like BB-8 from Star Wars: The Force Awakens, Desert Chica has you covered there, as well. Star Wars Valentines – The Joys of Boys has six valentines all based on favorite Star Wars characters. You also can make a simple light saber out of Smarties to attach to the card! Star Wars Valentines with Light Sabers – Everyday Savvy has a series of Star Wars valentines that also feature favorite characters, plus you can make simple light sabers out of glow sticks! Star Wars Valentines With PicMonkey – I love PicMonkey. You can very easily create your own Star Wars valentines that feature your own child. Desert Chica walks you through how to use this free program to make them. Free Star Wars Printables – This collection from Tips From a Typical Mom includes nine different patterns and sayings. 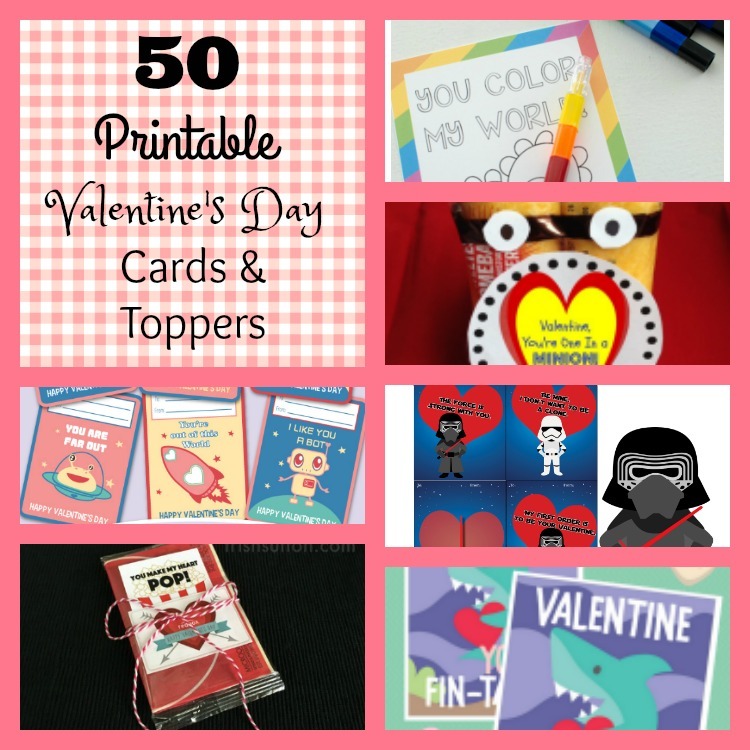 Star Wars Valentines – Wit and Wander created this set of printables that have adorable kid-like versions of the characters on them. Outer Space Valentines – These printable cards from Momerish may not be Star Wars, but they are related with a space theme and very cute! Out of This World – The Joys of Boys keeps the space theme alive with this collection of six cards in three different sayings. Superhero Valentines – Are you a fan of the Hulk, Iron Man, Captain America, or Thor? Generations of Savings made a set of MARVEL Avengers cards just for you! Avengers Valentines – Want even more Avengers? Check out these printable valentines from The Joys of Boys. Lego Batman Toppers – Did you see Lego Batman yet? All of the kids in my life are going crazy over this movie. Simple Made Pretty created these printable Lego Batman toppers that you can attach to any kind of treat bag. She managed to find Lego shaped candy to fill hers. Super Hero Valentine Printable – Rockin’ Boys created this printable as a super hero valentine that you can put into a frame for your favorite super kid, but you could even use these to make valentines or stickers to pass out for the holiday. Super Mario Printable valentines – Or if your superhero favorites run more along the video game lines, Over the Big Moon has these fun printable valentines based on the Super Mario characters. Baymax Valentines – Who didn’t fall in love with Baymax in Big Hero 6? Desert Chica loves him as much as you do and has two different varieties available to print. And then your child can color in these Big Hero 6 printables for a personalized touch. Frozen Valentines – Frozen is still really hot with kids. Desert Chica took some of the movie’s best quotations and turned them into pretty printables for you to pass out. Frozen Free Valentines – Those who love Princess Anna and Elsa will love these printables from LinnieP. You’re One Cool Valentine – Simple as That Blog has two printable valentine cards that feature Anna and Elsa or Olaf. Finding Dory – Finding Dory is such a sweet movie that is getting a lot of play on my Netflix account. Download the valentines from Mommy’s Bundle to share. Disney Inspired Valentines – Flash back to the classics with these printables from The Momma Diaries, featuring inspired pieces like Dumbo, Snow White, and more! Inside Out – I think Inside Out is still one of my all-time favorite Disney movies ever. I can’t tell you how many times I’ve watched it. Disney Family, of course, has a collection of valentines available to print. Mary Poppins – Mary Poppins is one of my other all-time favorites that I have seen dozens of times. Restless Risa made these cards that you can add to coated spoons. Disney Fairies – Disney Family also has printable valentines that feature your favorite fairies! Moana Valentines – Did you see Moana yet? Embrace the latest Disney classic with these inspired printable toppers from Best Toys for Kids. Adorable Disney Valentines – Beauty and the Beast is a hot one right now with the upcoming film. Mommy Scene has a printable one, along with other favorite Disney movies, such as Up, Little Mermaid, and so many more. Noncandy Treat Labels – Are you skipping the candy this year? Maybe try some art supplies or small bottles of bubbles. Generations of Savings has toppers and cards to go with those! Minecraft Valentines – Minecraft is still huge with kids. Appeal to their love of the game with these free printable valentines from The Joys of Boys. Free Printables – Life is a Lullaby has three simple sayings on little cards that you can use either just as a card or attach to a small gift or treat to pass out. Harry Potter Valentines – Harry Potter is another favorite that doesn’t seem to go out of style. Momerish made these bookmarks that you can send out as cards or laminate for them to use for a longer time. You Color My World – 5 Minutes for Mom made these printable cards that your child can color in and attach to coloring supplies to show how much we all brings beauty and color to each other’s worlds. You Are Dino-Mite – Calling all dinosaur lovers! Use these printables by Creative Simplicity to attach to little dinosaur toys or simply to pass out. Lego Valentines – Legos were a favorite when we were kids and now they are more popular than ever. The Joys of Boys has some Lego themed printable valentines that you can pass out. You’re Fintastic! – This one is for the shark lovers out there and comes from Crafts on Sea. Animal Valentines – These simple cards from Generations of Savings feature the birds and the bees, a beautiful children’s version, that is. Monkey Valentines – These little printable cards from Beauty Through Imperfection are sweet and simple. Valentine’s Placemats – If you really want to do something different, Coffee With Us 3 has a printable placemat that you can share with friends. It’s available in black and white to be colored in. Or to save time, print one already in color. Scratch Off Valentines – Dollar Store Crafts has these cute printable valentine riddles. To find out the answer, you have to scratch off. Complete tutorial included! Valentine’s Day Jokes – For even more laughs, you can use these free printable joke cards from Capturing Joy. Printable Valentines for Boys – Okay, I admit that I hate dividing up valentines between the sexes, because I think kids can go either way in their tastes. But I do love this collection from Brain Power Boy. Get pirates, robots, aliens, and superheroes all in one spot! Woodland Animals – Marvelous Mommy has the most precious valentine toppers using puns based on favorite woodland animals. You can attach them to the top of your treat bags! She also has a sweet set that can be printed to use for Valentine pencil holders. Valentine’s Day Treat Toppers – I am also madly in love with these adorable penguins in the printable from Just Peachy Designs. They are just so cute!